Egg-in-Toast Grows Up: Egg-in-Toast – Eat Me. Drink Me. Breakfast has never been a big ritual in my family. Cereal and milk, Pop Tarts, granola, leftovers from dinner the night before – anything went as long as it was fast and could be gobbled up before the bus drove by. Besides Christmas morning, the only time that breakfast was anything special was when my grandparents came to visit. Oatmeal is forever associated with my grandpa, though I know now that the creamy butter and brown sugar confection he served me was far from the ascetic, heart-healthy version he ate. When my grandma came, she’d almost always buy a pack of bacon and I’d eat far more than any child should eat in one sitting. But my favorite grandma specialty was one that goes by different names for different people, but which we always quite unassumingly called egg-in-toast. Egg-in-toast is simple. It’s a piece of buttered bread with a hole ripped out of the center that gets browned in a skillet and serves as a holding pen for an over-easy egg cracked right in the middle. So simple, but so good. I remember egg-in-toast being a given on weekends, when there was also time for bacon and sometimes oatmeal as well, but there’d be at least one school night where my grandma would say, “Don’t forget to wake up early tomorrow so I have time to make you an egg-in-toast.” And though I hated waking up early, egg-in-toast was always a good reason to get up. Today, through a series of budding coincidences – some leftover freshly-made, organic bread, one lone egg in the carton dying to be eaten, cilantro on the brink of ruin – I realized I had everything I needed to make my own egg-in-toast for breakfast. It felt strange to stand at the stove, ripping holes out of bread and cracking eggs into a hot skillet, because I’d only ever watched it happen. For some reason, as I got older, my grandma stopped making me egg-in-toast, though had I asked, I’m sure she would have gladly cooked it. Like other things – being sung to sleep, walked to the bus stop, waited up for in the evenings – I don’t know when they stopped, but their ceasing seemed natural. Standing at the stove reminded me that I hadn’t had an egg-in-toast in years, probably not since I couldn’t see over the top of a burner. All at the same time, I was my grandmother, my child self, my present self, and still in front of me the same egg-in-toast. 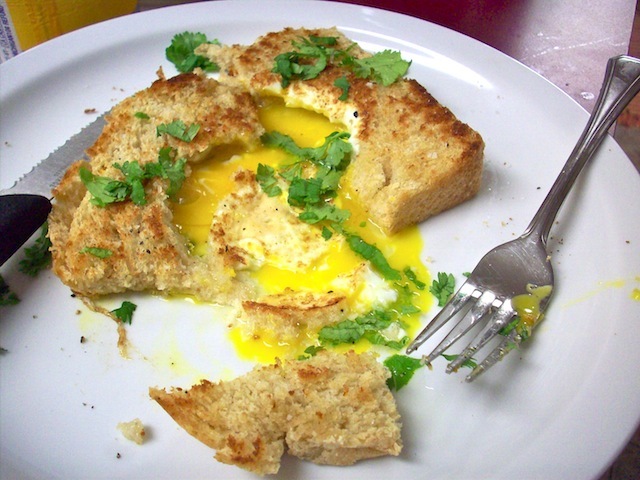 Although my egg-in-toast was an aesthetically different bird from my grandmother’s – a bit more “grown up” with organic wheat bread and cilantro, its principle components were there, as were the memories in each bite. And memories like that taste good. Butter one slice of bread on both sides, then cut a circle out of the middle. Place bread in skillet over medium-high heat and crack egg into the hole. When the egg is solidified on the bottom and the white is cooked most of the way through, flip the whole bread-egg unit to the other side and cook just until the whites are solid. The egg yolk should be runny on the inside and the whites sealed to the bread on the outside. Remove from skillet. Sprinkle with chopped cilantro, salt, and freshly ground black pepper. I call this a toad-in-the-hole. Is that weird?